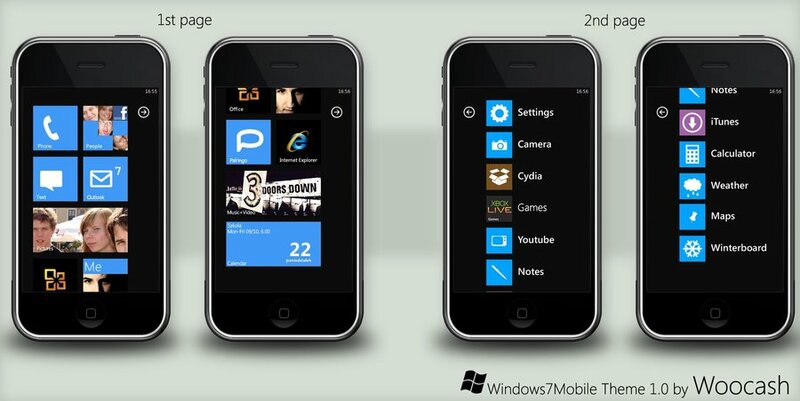 Wrong, so so wrong… woocash-kun on deviantart.com has posted a theme for the iPhone that looks just like the new Windows Phone 7 software. 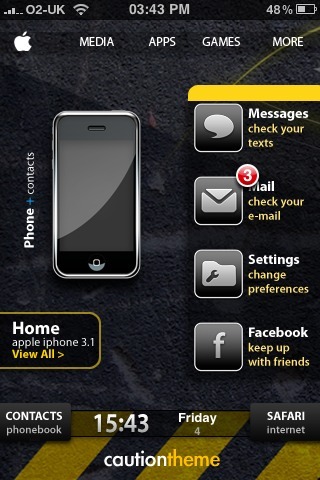 This isn’t just for the home screen but it also includes the lockscreen and loading screens. It’s not available yet for download and of course it’s not for everyone. But if you really want your iPhone to look like Window Phone 7, this looks like the real thing. This theme is pretty sweet looking but these types of themes are always a pain to try and get setup correctly so here is a video that guides you through it. A i r o, by Pur3x, contains 61 icons (some of which are alternative icons), wallpaper, dock, lockscreen wallpaper, lockscreen battery, badges and quite a few UI mods. Overall, the theme is nicely designed and the UI mods are subtle and clean. I did notice that the “Slide to Unlock” text looks a little funky… it is moved over to the right but still slightly visible. You can fix this by using either the Slide to Unlock Killer or the No “Slide to Unlock” Text hacks. For more info about the theme, check it out on deviantART. You can get the A i r o theme via the modmyi source. Normally I stick to writing about themes that can be installed via Cydia however, there are so many AWESOME themes that can only be installed via SSH… and Sista is one of them. I found Sista, by SoundForge, on MacThemes and instantly loved it! It is a nicely designed, clean theme. The theme’s package contains a decent amount of icons and a .PDS file so that you can create your own. I will be honest, I’m partial to the Smoog theme via the BigBoss source but, it’s nice to change it up every once and a while! Below is info about the theme and a link to the download. It has been snowing here for the last few days so, I thought it was probably time to break out the Christmas mods! Hopefully they will put you in the Christmas spirit! Below are a few of the better Christmas themes as well as some Christmas mods and links to some Christmas wallpaper packs. Let me know in the comments if there are any Christmas themes that you really like that are not listed below. Acropolis Luz is a WinterBoard theme that contains quite a few mods. Like most themes, it contains icons (303 of them), a dock, status bar, wallpaper, lock screen battery, slider, badges.. etc. However, it also contains a ton of other mods such as Message app mod, Phone app mod, Safari app mod, UI mod, pop-up mod, Cydia app mod… and much more. If you are photoshop savvy and like to create your own icons, the theme does contains a .psd file which is located in the Library/Theme/Acropolis Luz [Krs]/PSD folder. 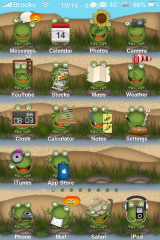 The theme also contains a matching SBSetting theme. You can get both Acropolis Luz and corresponding SBSetting theme via the MacCiti source. trichome is a very nicely designed WinterBoard theme that contains 39 small icons (some are alternate icons), a wallpaper, dock, badges, pop-up mod, live clock mod and page indicators. I really like the live clock mod implementation. You do not have to have the actual LiveClock app installed for the live clock to work with this theme… it is built into the theme. The theme also contains an icon mask which resizes all icons (besides web clip icons) so that they match the themed icons. It also contains a detailed .psd file allowing you to create your own icons for the theme. You can get trichrome via the modmyi source. 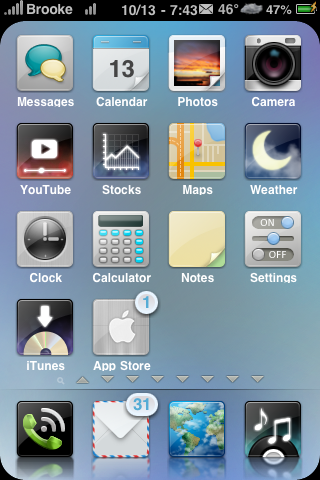 Meu is a WinterBoard theme that contains around 40 icons (some of which are alternate icons), wallpaper, dock, statusbar, badges and a lock screen battery. The stock theme does not contain a Calendar, Stocks or App Store icon. However, I made a few icons really quick that you can manually add to the theme (see below). The theme does contain a .psd icon template allowing you to create your own icons. You can get Meu via the iSpazio source. 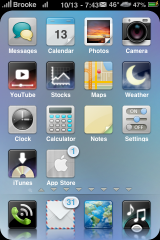 Suave is a very nicely designed WinterBoard theme by Thyraz. The theme contains 114 icons including; icons for all the stock applications, a few additional applications and quite a few alternate icons. The theme also includes a wallpaper, statusbar, page dots, badges and a dock. The icons for this theme are smaller than the stock icon size however, the theme contains mask that re-sizes all the icons to match… even icons that are not actually modded by the theme. It does not however, re-size web clip icons. There is a .psd icon template located in the theme’s folder (Library/Themes/Suave.theme) for those of you who would like to create your own icons. For those of you who would rather not create your own icons, you can get additional icons by visiting the theme’s original post on MacThemes. Suave is available via the modmyi source. Amphibious is an extremely unique theme. Normally, I’m not big into “themed” themes, but this one is very well designed. The theme contains quite a few mods including a Weather app mod, iPod app mod, lockscreen mod, lockscreen battery mod, badges, page dots, statusbar, dock, wallpaper and 50 icons. The app also includes 7 alternate wallpapers, an alternate dock, an alternate statubar bar and quite a few alternate icons (these alternate mods would all have to be viewed/changed via ssh). The developer of the theme does give you a few options in WinterBoard including the ability to turn on/off the Weather app mod, the iPod app mod, the lockscreen battery mod, the Digital LiveClock mod, the Lockscreen mod and the option to choose a 4 icon or 5 icon dock wallpaper. This makes the theme easily customizable. 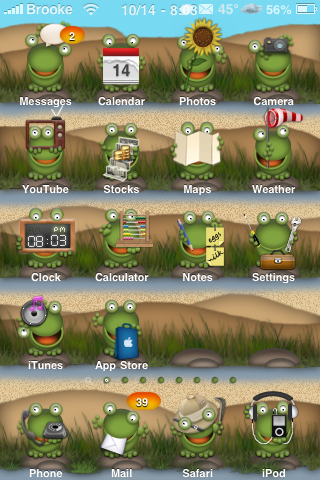 You can get Amphibious via the modmyi source. PreTend is a WinterBoard theme created by james and contains 27 icons, a statusbar, dock, badges, page dots, statusbar icon mods and four wallpapers. The theme also contains an icon template and a wallpaper template. Both are .psd files. The only manual modding I had to do on this theme is that I ssh’d in and changed the Music.png to iPod.png so that there was an icon for the iPod application (the icons are located in the Themes/Pre-Tend/Icons folder). Below are screenshots of the theme as well as screenshots of all four wallpapers available in the theme’s folder. You can get PreTend via the iSpazio source.